"Dragunity Militum" equipped with "Dragunity Phalanx", in the artwork of "Dragon Mastery". "Dragunity" (ドラグニティ－ Doragunitï) is an archetype released in the Duel Terminal. The term "Dragunity" is a portmanteau of the words Dragon and Unity. Their effects mainly revolve around equipping any Level 3 or lower Dragon monsters in your Graveyard to your Winged Beast monsters in play (in the sense of the Dragon transforming into weapons, or the Winged-Beast "Dragunity" monsters "uniting" with their Dragon "steeds" as "Dragunity Knights"). Because of their heavy focus on sending monsters to the Spell & Trap Card Zones, the "Dragunity" archetype is often compared to the "Crystal Beast" and "Cyberdark" archetypes. They also utilize powerful Dragon Synchro Monsters, although they require Dragon Tuner monsters and Winged Beast non-Tuners. The Dragon "Dragunity" monsters so far all have armor which either covers most of their body ("Dragunity Phalanx"), or have a piece of armor that resembles, and is named after, a weapon (i.e. "Dragunity Darkspear"), or wielding the weapons themselves (i.e. "Dragunity Arma Leyvaten"). "Dragunity" is probably a portmanteau of "Dragon" and "Unity". The Dragon "Dragunity" monsters are named after either a pole weapon or a strategic military grouping. By contrast, the Winged Beast "Dragunity" monsters seem to be named after historical warriors (e.g. "Dragunity Legionnaire" is named after the common soldier in the Roman army). The main purpose of "Dragunity" Decks is to have combo plays available for easy Synchro Summons. "Dragunity Phalanx" is the key card here - a Level 2 Tuner monster that can be Special Summoned while it is equipped to a monster. By equipping "Phalanx" to either "Dragunity Dux" or "Dragunity Legionnaire" (both of which can equip "Phalanx" as soon as they're Normal Summoned), they allows access to Level 6 or 5 Synchro Monsters respectively. The most used Synchro Monster in this Deck is "Dragunity Knight - Vajrayana", which has similar equipping abilities to "Dux" and "Legionnaire" that can be utilized to Synchro Summon a Level 8 monster (this is commonly known as "Synchro climbing" for most "Dragunity" duelists). This combo only requires "Dux" in your hand and "Phalanx" in your Graveyard, and it is incredibly simple to set-up with the help of "Dragon Ravine". It's basically a "Dragunity" version of either "Reinforcement of the Army" or "Foolish Burial": it allows you to prepare cards that are necessary for your combo, while also maintaining the longevity and consistency of your combo. This allows you to continuously Synchro Summon in virtually every turn. A notable Synchro monster to make with this combo is "Crystal Wing Synchro Dragon". After Shining Victories it is very easy to make in "Dragunity" Decks, requiring the "Dux" and "Phalanx" combo, Synchro Summoning "Dragunity Knight - Vajrayana, and then equipping "Phalanx" again. Cards like "Dragunity Arma Mystletainn", "Instant Fusion" (with "Mavelus"), "Garuda the Wind Spirit" and "Silpheed" can provide more Summoning power, exponentially increasing their speed and allows more Synchro and Xyz Summons in one turn. "Tempest, Dragon Ruler of Storms" (Traditional Format only), combined with "Gold Sarcophagus" can also help search "Dragunity Arma Mystletainn" (or any other WIND Dragon monster necessary for your combo), aiding in consistency. 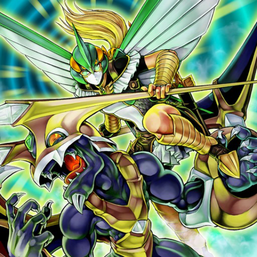 Other support cards such as "Hieratic Dragon King of Atum" and "Red-Eyes Darkness Metal Dragon" allows the Deck to take their Synchro Summoning power into the next level, raising their capabilities of Summoning multiple monsters at once, and at the same time, allows them to occasionally perform an OTK or create near-invulnerable fields such as "Stardust Dragon" + "Queen Dragun Djinn" + "Photon Strike Bounzer" combination. Because of this, they can also utilize Rank 6 Xyz Monster for handling certain difficult-to-approach scenarios, such as "Gauntlet Launcher", "Constellar Ptolemy M7", "Number 24: Dragulas the Vampiric Dragon", and "Number 39: Utopia Beyond". However, "Dragon Ravine" was at a low legal number, burdening "Dragunity" with a major loss in consistency and power, while "Tempest, Dragon Ruler of Storms" is now Forbidden. With the September 2017 List (TCG) and October 2017 list (OCG), "Dragon Ravine" is no longer on either lists, thus "Dragunity" regaining all of its former consistency. The Deck's main strategy is "Dragunity Dux" or "Dragunity Legionnaire", which makes negating their effects with "Effect Veiler" or "Breakthrough Skill", or destroying them before their equipping effects kicks in with "Bottomless Trap Hole", "Torrential Tribute" and "Solemn Warning" really troublesome for any "Dragunity" players (especially in early game stage). "Ghost Ogre & Snow Rabbit" also proves very problematic, causing key cards to resolve without effect such as "Dragon Ravine", "Dux", "Legionnaire", "Vajrayana" and "Phalanx". "Dragunity" Decks relies on their Graveyard since they need monsters, such as "Dragunity Phalanx", in the Graveyard to execute their combo plays, which means that cards that can banish other cards, like "D.D. Crow", "Crevice Into the Different Dimension", "Chain Disappearance" and "Banisher of the Radiance", or cards that prohibits Graveyard access like "Necrovalley" and "The End of Anubis", can be reliable counters against "Dragunity" Decks. Since most "Dragunity" Decks are built in turbo-style combo-based strategy, cards that disallow or disrupt Special Summons, such as "Vanity's Emptiness" and "Fossil Dyna Pachycephalo", are very catastrophic for this Deck. Despite the numerous disadvantages "Dragunity" users face, "Dragunity" Decks also have ways of dealing with these cards. "Debunk" and "Mind Drain" can stop "Maxx "C", "Gorz the Emissary of Darkness", "Effect Veiler", and "Ghost Ogre & Snow Rabbit", while "Imperial Iron Wall" completely annihilates any and all banishing attempts (albeit it also prevents you from Special Summoning any of your "Dragon Rulers" if you utilize them). You can add Spell/Trap removal cards to get rid of threats like "Poisonous Winds", "Dimensional Fissure", "Macro Cosmos", "Vanity's Emptiness", etc. Their archetype symbol is the green emerald for the Dragon monsters, and for the Winged Beast monsters is the green emerald surrounded by a gold outline of wings. As with the "Blackwing" archetype, there is a heavy distinction between the Tuner monsters and the non-Tuner monsters in terms of appearance. Similar to "Blackwings", the non-Tuner monsters are all humanoids in bird outfits with mechanical-like wings, while the Tuner monsters are composed of small, armored dragons (whereas the "Blackwing" Tuner monsters are all small birds). Their "rider and mount" style, as depicted in their "Dragunity Knight" forms, are also adopted by later archetypes, such as "Gusto" and "Ritual Beast" (albeit with different types and mechanics). This page was last edited on 15 February 2019, at 03:29.